The image was released by Casa Real as the big day came to an end and surprisingly not shared on its social media channel, just its website. It shows the birthday king with his wife, Queen Sofia, and two of their three children. King Felipe VI and Infanta Elena were expected while there were always question marks over whether Infanta Cristina would be there given her personal situation. 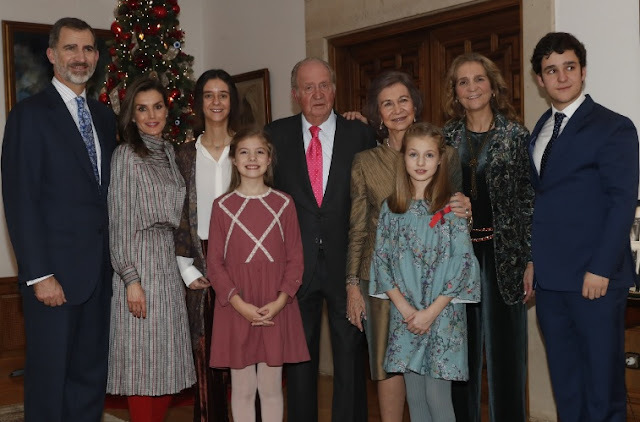 Four of the birthday monarch's eight grandchildren also attended as did Felipe's wife, Queen Letizia. We could well see Juan Carlos again tomorrow when he is reported to be attending the Pascua Militar at the Palacio Real, traditionally the first royal engagement of the year. It could be the first of several high profile moments in the coming twelve months for Juan Carlos as he is expected to be a central figure in celebrations for the 40th anniversary of Spain's constitution this year. A right royal start to what could be a truly regal 2018.